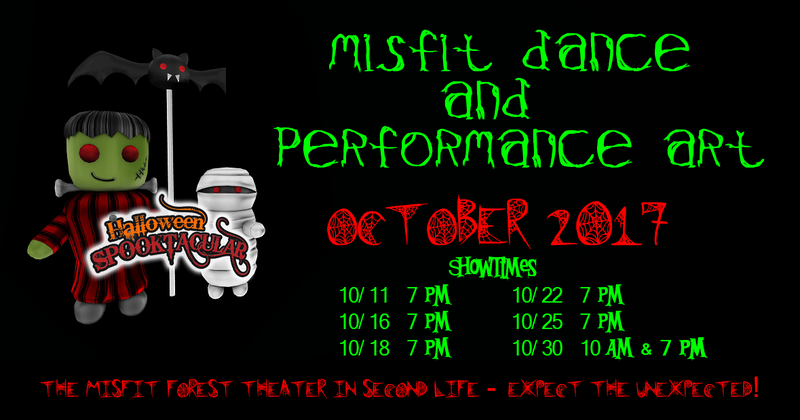 This is the 1st of a total of 10 performances of this fun filled show throughout October! Showtime is 7 pm SL — Pre-show “Spooky Tunes” music begins at 6:30 pm SL – Come join the fun! Misfit Dance & Performance Art is super spooked ( wait — we mean STOKED !) to bring you this special show. After the show stick around for our 30 minute set of " Audience Group Dancing starring YOU! " which will include fun props and amazing special effects! Please arrive early to guarantee your seat and to allow your viewer & PC to pre-load our graphics, animations & costumes so that the show will be in sync and fully rezzed for you.